Famous for its gorgeous azaleas that bloom in March, Bellingrath Gardens near Mobile, Alabama, is worth a visit even in the middle of summer. We arrived on a sultry July morning, wondering what might be in bloom. No need to worry. Open year round every day except Christmas, the 65-acre garden is lovely no matter when you go. Summer color comes from hibiscus, penta, coleus, caladiums, lantana, impatiens, petunias, bacopa, bougainvillea, and many other plant varieties. Our guide pointed out that the Rose Garden, which features 2000 bushes of 75 different varieties, is laid out in the shape of the Rotary symbol, a tribute to the chapter that garden founder Walter Bellingrath helped start in Mobile. Renovations are currently underway in the Rose Garden, with Phase One, featuring installation of a fountain and pool, to be completed by August. 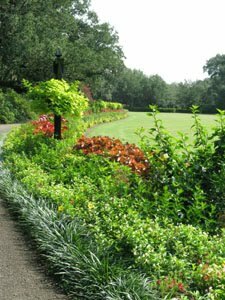 As we meandered along the 400-foot long path around the Green Lawn, our imaginations conjured visions of azaleas bursting with multi-colored blooms. During March up to 20,000 visitors come from all over the country to enjoy the spectacular flowers. Stately moss-covered oaks beside the path belie the fact that the original oak trees were demolished by Hurricane Frederick in 1979. 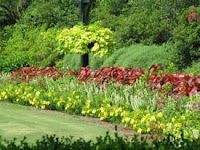 We wandered along the wide, easy paths of Bellingrath Gardens enjoying baskets of colorful summer plants hanging from the bridge over the lake. Yellow, pink, and white blooms radiated cheerfulness and kept us admiring each new scene. Bessie Bellingrath initially built the garden bordering on Fowl Lake. The property was an old fishing camp when the Bellingraths purchased it as a retreat for the hard-working Walter, but Bessie put her special touches on the landscape. Friends urged her to share the beautiful space, and the Garden was opened to the public in 1932. It proved very popular with 4700 people showing up the first day. 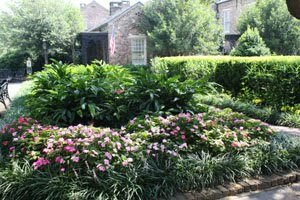 After Bessie’s death in 1943, Walter, who made his fortune bottling Coca-Cola, began to take an interest in the gardens as a way to honor his wife’s memory and passions. 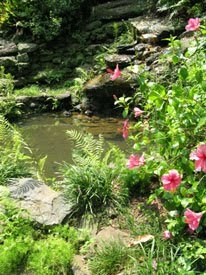 Under his guidance many water features, plants, and paths were added to showcase the natural beauty of the area. Mr. Bellingrath once said “The Gardens are like a beautiful woman with a different gown for each week of the year.” With the camellia blooms in winter, the azaleas in spring, roses in the summer, chrysanthemums in autumn and Magic Christmas in Lights during the holiday season, Bellingrath Gardens and Home is a constant thing of beauty.